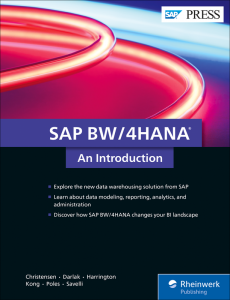 What is SAP BW/4HANA? More importantly, what can it do for you? Between these pages, you’ll explore the answers to these questions, from simplified data models and SAP BW/4HANA Analytics to automated data lifecycle management. You’ll find step-by-step instructions for installation and setup, a guide to administrative tasks to keep your SAP BW/4HANA system in tip-top shape, and the low-down on security in your new system. Explore the data warehouse of the future! Get an introduction to the benefits and capabilities of SAP BW/4HANA and how it takes advantage of the SAP HANA database. What does SAP BW/4HANA do? Explore new, flexible data models, dive into SAP and third-party tools for reporting and analytics, and investigate your options for external data source and data lake connectivity. How do I get SAP BW/4HANA? Understand the prerequisites for installing SAP BW/4HANA, from hardware specifications to service pack levels. Get step-by-step instructions for deploying the solution both on-premise or in the cloud. Jesper Christensen, a senior partner at COMERIT, Inc., was part of the SAP BW Regional Implementation group at SAP that initially rolled out SAP BW. He is an internationally recognized subject matter expert in business intelligence, a contributing author to international BI journals, and a frequent speaker at SAP and BI-related conferences. His leadership at COMERIT helped Tetra Pak win the Gartner Award of BI Excellence in 2009. Jesper has helped many global companies migrate their SAP BW system to SAP HANA including optimizing the systems for migration to SAP BW/4HANA. Joe Darlak, associate partner at COMERIT, Inc., has been successfully implementing SAP BW for clients since 1998, including multiple large-scale, full life-cycle global rollouts. He has significant experience increasing the capacity, reliability, and performance of SAP BusinessObjects BI systems, defining and implementing processes and controls to stabilize service and mitigate risk, and improving the competency and skill sets of implementation and client service teams. Recently, he has architected one of the largest SAP BW migrations to SAP HANA on record and has been instrumental in defining best practices for SAP HANA at Fortune Global 100 clients. Riley Harrington is a senior SAP BASIS associate with COMERIT, Inc. He is the system administrator for COMERIT’s infrastructure, in support of remote development, testing, and training services. Riley is experienced in migrations, installations, upgrades and troubleshooting of SAP HANA, SAP BW, SAP ERP, SAP Solution Manager, SAP BusinessObjects, Tableau Server and VMware. He is a veteran of the U.S. Navy’s submarine force and received a bachelor of science in management information systems from the University of North Carolina at Charlotte. Li Kong is BI expert working for COMERIT. He is certified SAP BW consultant with more than 14 years of experience with global BI implementations. He has lead BI teams to implement SAP HANA, SAP BW, and SAP BusinessObjects BI solutions and has successfully migrated SAP BW to SAP BW on SAP HANA. He has worked with the architecture and implementation of SAP BusinessObjects BI, SAP HANA development, and big data. Marcos Poles is a senior SAP business intelligence and analytics solution architect and the author of a number of rticles published in international BI journals. His expertise is in SAP BW, SAP BusinessObjects BI, and SAP HANA. Marcos started his SAP career in 1996, became SAP Academy instructor in 1998, and subsequently successfully managed and delivered multiple large-scale solutions for global corporations in Americas and Europe covering major business processes such as order-to-cash, supply chain management, financial accounting and controlling, customer activity repository, and demand signal management. Christian Savelli is a senior information engineer and business intelligence solution architect with multiple SAP certifications and several published articles in international BI journals. He holds SAP certifications covering SAP HANA, SAP BW, and SAP ERP applications. Chris also has expertise in managing all aspects of the information creation process, and utilizing SAP’s BI technologies to satisfy strategic, analytical, and reporting needs. During the last two decades, Chris Savelli has managed, led and delivered several, large-scale BI initiatives for companies across the globe, including the Americas, Europe, and Pacific regions.